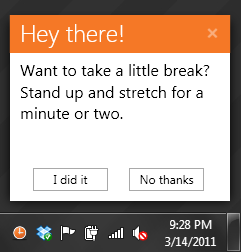 BreakTaker is a lightweight application for Windows that reminds you to take breaks while working on your computer. By encouraging you to take short breaks at regular intervals, BreakTaker can increase your overall productivity and can alleviate common workplace injuries resulting from fatigue, eye strain, and repetitive stress injury. 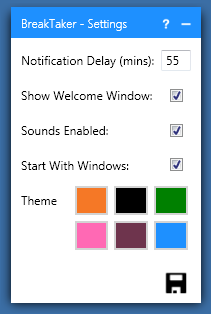 After launching BreakTaker, right click its icon to change the time between break notifications. The default notification delay is 55 minutes. BreakTaker is written in C#, WPF, and .NET 3.5. I’ve uninstalled BreakTaker, but when I restart my computer I receive a message asking me if I want to re-install it. Open the Start menu, select “All Programs” in Windows 7 or “Program Files” in Windows XP. Locate the “Startup” folder. Within this folder should be a shortcut to BreakTaker. Right click the BreakTaker shortcut and select “Delete”. BreakTaker now loads faster by checking for updates when it closes rather than it opens. Added “Pause timer when PC is locked” feature. If enabled, BreakTaker will automatically pause the break timer if you lock your PC. The timer will automatically resume when the PC is unlocked. Added more tooltips to Settings window – hover over any text or controls to view details about each setting. Added: Gray icon when BreakTaker is paused. So you don’t forget, you know? Fix: Default color scheme was reversed (white background with orange text instead of orange background with white text). Added themes! 6 themes initially: Classic Orange, Monochrome Black, Verdant Green, Flamingo Pink, Eggplant Purple, and Techerator Blue. Try them out by right clicking the BreakTaker icon and going to Settings. Added a link to the BreakTaker website in the About menu. Added a fancy-schmancy Pause icon to the “Pause BreakTaker” item in right-click system tray menu. Because it’s the little things that matter. Minor bugfix: The “Start With Windows” checkbox in the settings window was checked or unchecked based on the presence of the shortcut in the Start Menu –> Startup folder. Changed this to look at the value stored in settings instead, which is the correct functionality. Thanks to Elton Muuga pointing this out. Minor bugfix: If changes to autorun settings were made, they wouldn’t take effect until the program was closed and restarted. Now the changes take effect immediately. In line with knowledge learned from Version 1.1.0.0, made more modifications to how the program autoruns. 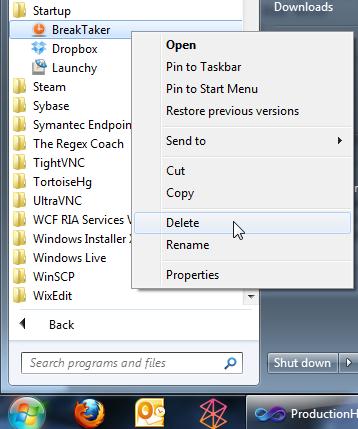 Decided to use the Start Menu –> Startup folder method to autorun the program rather than use registry keys. Added code that automatically checks for registry keys set in previous versions and removes them. Squeaky clean. Thanks to Ryan Nielson who pointed out a bug in how the autorun was configured. Basically, ClickOnce is very picky about how you launch it and if you launch the executable directly, it doesn’t see it as a ClickOnce application anymore. The app still runs just fine, but it won’t return the correct version number and won’t check for updates. Rewrote autorun code to point to the ClickOnce shortcut which is a .appref-ms file. A minor version number upgrade! Welcome to 1.1. Changed support URL to new site (http://www.techerator.com/software/breaktaker). Added desktop icon during installation. Notification titlebar turns red when you’ve ignored a break. Turns back to orange once a break is taken. Added mutex to prevent multiple instances of application running. Fancy. Changed support link to this site (http://www.techerator.com/breaktaker Modified in 1.0.0.38).